It seems to be Bulbophyllum week in the greenhouse and to follow yesterday’s miniature species we have the much larger growing and larger flowered Bulbophyllum carunculatum. This epiphytic Bulbophyllum is endemic to the island of Sulawesi, part of the Indonesian islands. It produces a number of sequential flowers throughout the summer on a long upright flower spike. 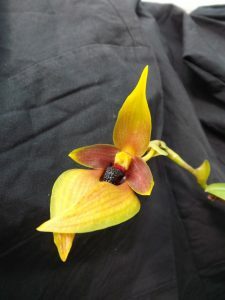 The flowers are typically yellow with an almost black lip, this colour form seems to be relatively uncommon with its orange petals and veining. The flowers carry an unpleasant fragrance which is used to attract the fly pollinator for the species.